Find a few photo app ideas to practically automate journal writing and to chronologically track the events and memories in your life. Not all apps on this page are for both iOS and Android devices. Compatibility: Requires iOS 7.0 or later. This app is optimized for iPhone 5. Compatible with iPhone, iPad, and iPod touch. If, despite your best intentions, you've found it hard to keep up with journal writing, then Heyday is an app that you need to know about. Heyday is a photo/video journal keeping app for iOS devices. After install you literally have to do next-to-nothing. It creates your daily entries for you, based on the photos that you are already taking with your iOS device. It'll be a visual trip down memory lane for you. It is hard enough to remember what you did last week, much less what you did a year ago. But with this app you will be able to retrace the path of your digital life, as seen through the lens of your device's camera, at least. So, now you have a reason to be taking all of those photos. It will remind you of the events in your life from a year ago, two years ago, and so on. 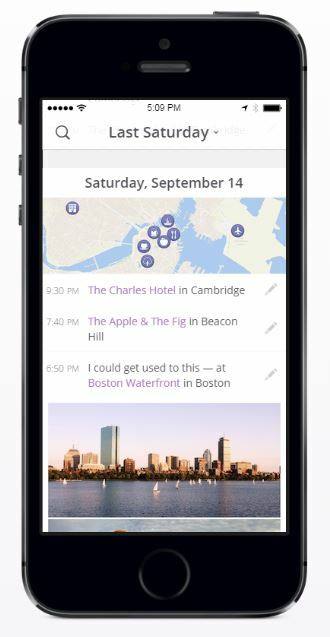 Heyday will organize the activity (photos and places you've been) even before you installed the app. This is assuming, though, that you still have the pictures on your phone or device. This app helps you create a private, personal timeline of your life. It does not share anything with anyone (Facebook, email, etc) unless you give it express permission to do so. I think that Heyday would be a great app to use for documenting your travels, keeping a chronilogical accounting of where you went and when. Heyday is currently available only for iOS devices. The company is working on an Android version. If you are an Android user, you can go to the Heyday site and add yourself to a notification list. In the meantime: Comparable photo app alternatives, if you can't wait, include Timehop, Path and Journey. Like, Share or leave your comments in the Facebook form, below!